Just Romantic Suspense: Have You Ever Been To A Rodeo? Congratulations to "Jeanine", the winner in D'Ann's giveaway. Thank you to all who participated! Have you ever been to a prison rodeo? What’s the difference, you ask? A lot! In the PRCA—Professional Rodeo Cowboys Association—cowboys are free to move about the country and world as they choose, riding when and where they like. In prison rodeo, held at Angola Penitentiary, on one weekend in April and every Sunday in October, inmates are the cowboys. Trustees, who have earned the right to ride, compete in eleven events such as “Convict Poker” in which four men sit at a table and an angry bull is released into the arena. Last man sitting wins the hand! Another one is “Guts and Glory” where a poker chip is tied to the horn of an angry Brahman bull and the first inmate to grab it wins. All the events are as hairy and dangerous as these two! One event prisoners do not compete in is barrel racing. Angola prison rodeo is a stop for professional barrel racers who follow the circuit. In addition to the arena events, prisoners also make and sell arts and crafts. There are concessions, which include alligator sandwiches! All made and sold by inmates. Children can enjoy pony rides, carnival games and space walks. Started in 1964, the rodeo has become such a draw that a 10,000 seat arena was built in 2000. The rodeo, which generates up to $450,000 a day in revenue, pays for everything from schooling to funerals for the inmates. In Mississippi Blues, Jace Hill has never been a participant in the prison rodeo. Five years ago Trey Bouche found his best friend - with blood on his hands - standing over a body. Although Trey wanted to believe in his friend’s innocence, he was forced to testify in court, and Jace was sent to prison for life. Trey returns determined to prove he was right. Even if it means losing the woman he still loves. Summer Hill cannot forgive Trey, or his father, the chief of police, for the wrongs she feels they did to her family. When her brother escapes from Angola, Summer vows to keep her brother safe, no matter the cost. Falling back in love with Trey again isn’t an option. Now, five years later, the past begins to unravel. Reluctantly thrown together, Summer and Trey follow a twisted path that lead them to the truth - Jace didn’t kill anyone and an entire town’s ugly secret is unveiled. But more importantly, can Trey and Summer rediscover the love they lost? Something tangible sizzled in the air, an undercurrent of high tension. Jace Hill shot a glance around. All the other cons seemed normal, so he pinched his lips together. The last thing he needed was to draw any attention to himself. Angola guards were quick to use their clubs first and slow to ask questions later. Most were overly eager to put anyone in the hole who looked at them the wrong way. Jace figured out a long time ago it was safest to keep his head down and his mouth shut. After five years behind the prison’s unforgiving walls, he’d learned the art of living an invisible life. Like a ghost, he moved about praying no one saw him. Keeping low was how he’d survived so far and how he planned to keep on surviving. To the guards, the cons, anyone on the inside, he had no name, no identity beyond the number stenciled across the back of his orange jumpsuit–20010. Someone yelled, and the driver tromped on the gas shooting the bus forward. Whether from its unusual speed, or the deep ruts, the vehicle whipped from side to side. One tire dropped into the shallow ditch lining the road, tipping the bus still rolling on two wheels. Shackled to a steel pole, Jace’s arms screamed a protest when the movement jerked him sideways. His limbs stretched so hard he feared them being pulled out of their sockets. The floor seemed as if it were going to fall from under his feet. Shouts and curses filled the air. For a moment, it felt as if the bus would right itself. But instead, it flipped, sliding down an incline. The chains anchoring Jace to the pole broke in half, and he flew like a basketball. Someone’s fist or foot hit him in the face, his ribs slammed into solid metal. He grabbed for something solid, but caught only air. The squeals of tearing tin sounded like a dying animal. Or maybe he only heard his own cries mingling with the others. His head crashed into the ceiling and the world went black. 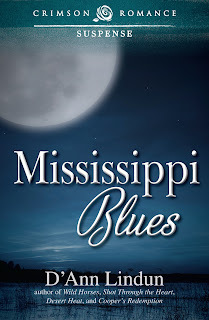 D'Ann will be giving away a digital copy of MISSISSIPPI BLUES to one lucky person leaving a comment or email entry! There's a setting you don't see in every romance! Sounds like a great read. Count me in! Anyways, I'm digressing....book sounds fab, looking forward to reading more about Trey and Summer! No need to apologize! Thanks for coming by! Sounds like another great read from you. Looking forward to it. Thanks, Karen! Not a western, though! Added to my list - wish it was on sale for the Nook too. I'm sorry, Mary! Maybe next time! Oohh suspense and a couple who must right a wrong. What a great story! A really interesting blog, D'Ann. I've never heard of prison rodeos before. Your novel sounds like a great read. Congrats! Truth be told, I didn't know that much about them either! I didn't know there were prison rodeos. Interesting post! Already got my copy! If you ever get the chance, you should go! I bet you'd never forget it! I love your posts, I always learn something new. I had no idea there were prison rodeos. Thanks. Thanks, Andrea! That's a nice compliment! I love D'Ann's books and can't wait to read this book!! I had no idea there were prison rodeo's either! Love going to rodeos - there is something about the friendly competition between the cowboys and the absolute focus once they're participating that is amazing. I'd never hear of a prison rodeo before - sounds like a great program! I finished this book not long ago and loved it - good luck and I hope you sell a MILLION! I've been to a rodeo, but never a prison one. Loved the excerpt! Your book looks amazing! Got to read it. I haven't been to any kind of rodeo. I would like to go to one just for the experience. They used to have prison rodeos at Parchman here in Mississippi. Always wanted to go but never got the chance. I have watched some of the Angola rodeos on tv. The book looks awesome and I can't wait to read it. I'm putting it on the wishlist. Thanks for the chance. Thank you, and you told me something I didn't know! Live and learn. I'd never even heard of prison rodeos before. Fascinating thank you. Thank you! They're pretty wild! I live in Colorado and I barrel raced in HS rodeo! Well, maybe you can make one sometime!!! I've been to a few rodeos. I love the buzz, and the charge of the crowd, but more so the cowboys who ride. :). I've never heard of a convict rodeo. Very different. Yes, prison rodeos are different! Exciting! This is really interesting! I read MISSISSIPPI BLUES this week--great read, D'ann. Yes, they are extremely dangerous! I have seen bits of a Rodeo... did not know about prison rodeos... really interesting! Sounds like the prison is overcrowded and they've come up with a way to lessen the problem. You did win! Emailed you! I live in Texas, so I've been to a couple of rodeos, but never a prison rodeo, although it sounds like it would be fun to watch. Mississippi Blues sounds like a really good read. Prison rodeo would be a kick! Prison rodeos are awesome because it gives the convicts a purpose and drive that is positive. I've been to one too many rodeos, but never as a buckle bunny. LOL NFR is fun (meeting Cody Ohl was such a thrill). Looking forward to reading your book, D'Ann! I wanna go to the NFR sooooo bad! I couldn't see you a BB!